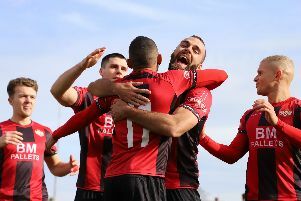 Kettering Town restored their 11-point advantage at the top of the Evo-Stik League South Premier Division Central with a comfortable victory at Latimer Park. No thrills and spills, this is the business end of the season and the Poppies took care of business. If I’ve said it once, I’ve said it a thousand times, the time for polished performances and five-star matches is over. At this time of year, if you’re challenging for honour or trying to avoid relegation then the only thing that matters is getting the right result. Kettering, as the league table suggests, have performed well over the last seven or eight months. There have been some excellent displays along the way. But now there is only one target and that is to get over the line and seal the title. Like their last home match, Marcus Law’s team did their damage in the first half. They went 2-0 up and then did a good job of managing the game. The points were in the bag and they never looked like they would slip from their grasp. At the business end of the season, you must take care of business and Kettering certainly did that on this occasion. Bouncebackability is a dreadful word but it’s something this Kettering team is good at. As you can see, I am not a huge fan of that word but it’s one that can be firmly associated with the Poppies this season. The record still stands - all six of Kettering’s defeats in the league in this campaign have been followed by victories. If you want to be a champion, you have to dig deep and strike back after you hit a bump in the road. Marcus Law and his players, of course, would have preferred not to lose at all but that’s unrealistic. So, if you lose a game then make sure you bounce back. This was the latest example. The 1-0 defeat at Biggleswade Town was a big disappointment. But the Poppies squad regrouped and got straight back to winning ways. If they go on to claim the crown, their ability to recover quickly from their losses will have played a big part. St Neots are facing the drop but they deserve credit for their efforts. St Neots had already taken the decision to reduce their budget and had initially suggested that they would take voluntary relegation at the end of the season before they rebuilt their squad almost from scratch with a number of young players. Since then, they have gallantly fought on but now find themselves in the bottom three and facing the drop. This was a legitimate case of ‘men against boys’ but anyone expecting a cricket score were sorely mistaken. Yes, Kettering were always in control but they came up against a hard-working young group who didn’t stop right until the end. St Neots have chosen their direction, it’s something clubs have to do sometimes, we know about that all-too well around these parts. They could have caved in after the Poppies struck early on but they fought and scrapped and defended with their lives. This was a big day for Kettering but they were made to work hard for it and, for that, St Neots deserve a lot of credit. Tom Knowles is always going to be welcome at Latimer Park. Sometimes things just happen to make you realise that it might just be your year. The tale of Tom Knowles and Kettering Town is a brilliant one and it has ensured that he will go down in club folklore should they go on and win the title. 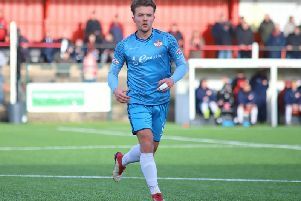 Just to refresh your memories, Knowles was on loan with the Poppies earlier this year and, in his only match action, he came off the bench and fired home a stunning free-kick to secure the crucial 2-1 victory at Stourbridge in late January. Fast forward almost exactly two months and Knowles was lining up against the Glassboys again, this time in the colours of Royston Town after he joined them for a loan stint from Cambridge United. With Royston’s game with Stourbridge poised at 2-2 on Saturday, the hosts were awarded a penalty and, you guessed it, Knowles stepped up to score from the spot to sink Stourbridge once again and allow the Poppies to restore their 11-point advantage at the top. It’s fair to say that young man will always be a welcome visitor to Latimer Park! Six games to go, three wins are needed. In truth, the Poppies probably won’t even need that. No, you still won’t hear me saying it’s over. But it now looks to be a case of ‘when’ and not ‘if’ as far as the Poppies claiming the title is concerned. The mathematics continue to change on a weekly basis but, as it stands, Kettering now know three wins from their last six games with guarantee them the crown. That, of course, is based on Stourbridge winning all of their remaining matches, which is a big ask and unlikely. Indeed, the Poppies might already have enough points! Time will tell but they can now make life that bit easier for themselves over the next three or four matches. A long trip to mid-table Leiston is the next port of call at the weekend and another victory there will put them on the brink. It’s an exciting time for everyone at Latimer Park but there is still a job to finish and it would be good to see them storm and not limp over the line.